An elusive gastronomic wonder, white truffles or tartufo bianco are, simply put, fungi found underground by specially trained dogs, in the Piedmonot region of northern Italy. Pungent in aroma and complex in flavour, white truffles are a highly prized culinary ingredient that sell for thousands of dollars per pound, making them a luxurious ingredient out of reach to the average home cook. 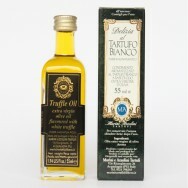 Truffle oil on the other hand is a much more affordable option. A few drops is all it takes to impart that unmistakable aroma and flavour. Add some affordable luxury to your next dinner and eat well at home!